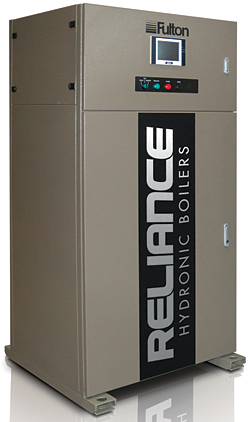 The Reliance high-efficiency unit features a copper-finned-tube heat exchanger with a stainless-steel heat-exchanger jacket. Pulse-width modulation with 5:1 turndown and a variable-speed blower motor ensure precise load matching to maintain building temperatures. The boiler features fiber-mesh burner technology for even flame distribution and lower emissions. It also features a color, touch-screen display with a ModBus communication interface. Control capabilities include pump control, freeze protection, and stack-temperature monitoring.